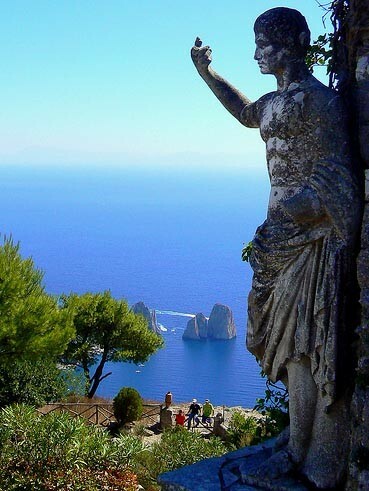 Capri is an island in the Tyrrhenian Sea off the Sorrentine Peninsula, on the south side of the Gulf of Naples in the Campania region of Italy. The main town Capri on the island shares the name. It has been a resort since the time of the Roman Republic. The etymology of the name Capri is unclear; it might either be traced back to the Ancient Greeks (Ancient Greek kapros meaning "wild boar"), the first recorded colonists to populate the island. But it could also derive from Latin capreae (goats). Fossils of wild boars have been discovered, lending credence to the "kapros" etymology, but on the other hand the Romans called Capri "goat island". Finally, there is also the possibility the name derives from an Etruscan word for "rocky", though any historical Etruscan rule of the island is disputed.